paul and i got a real christmas tree this year and i love it. i love the smell of christmas trees, i love putting the lights on the tree, i love decorating the tree. but i didnt realise i loved all these things until i had one of my own. so as lame as it may be to post photos of how proud i am of our first christmas tree, i am doing it anyway ;) Merry Christmas! It's a Christmas miracle--you posted! 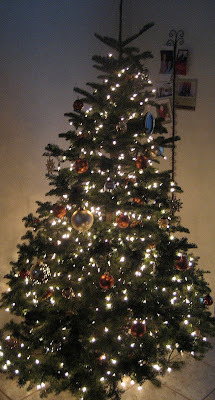 jk, it looks really good, and I think it's cute you blogged about your "first" Christmas tree. me likey. I love your tree...I just want to see you guys in front of it!! What are you thinking...stealing Melissa away from us??? I need to figure out how to get out there for a visit!! Oh my gosh - Katie is a blogger! Now just blog about your cute little belly and that baby! I want to see pictures! what a beauty! love the decor on it! p.s. we have a print for you guys, we just need the demensions of your frame! How pretty KK. I love it! LOVE IT! I had a hard time wanting to put mine up this year...but I'm glad we did! Merry Christmas! Love ya guys!